(May 8, 2018) Prairie grain farmers live and die by the prices and delivery opportunities for their grain. 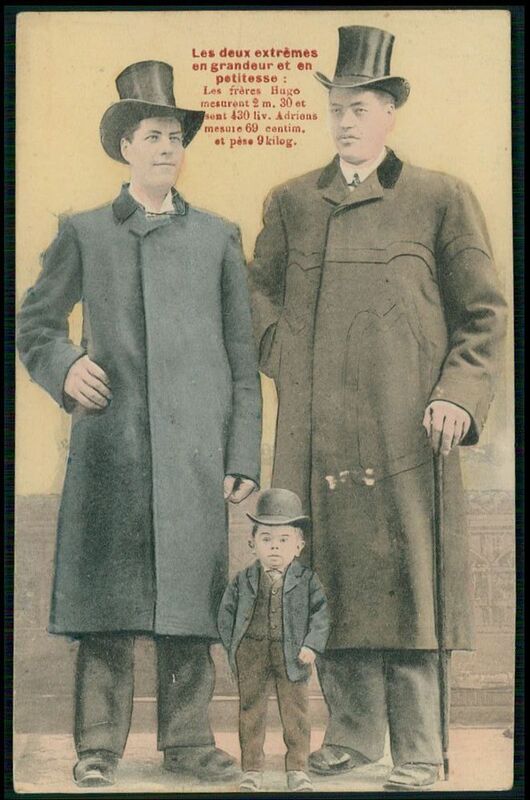 On both counts farmers have a strong sense of being short changed. When the price looks good and the basis is low, the elevator is often plugged. When the basis is high making the offered price lower, the elevator has space for deliveries. This smells like the bad old days when farmers brought grain to the elevator only to have the agent tell them there was no space for their number one wheat but there was still room for lower priced wheat if they wanted to take less. Now farmers are again finding elevators plugged when the price is high. The important question becomes: are farmers being short changed by the railways or by the grain companies? This past winter the grain companies have been telling farmers and pretty much anybody that would listen that the railways are not delivering rail cars. They claim poor rail service is why elevators are plugged so farmers cannot deliver their grain and ships are waiting at port. High basis costs and lower prices are sometimes blamed on the railways as well. 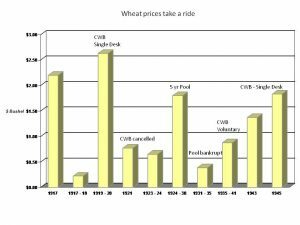 Is rail service for grain shipments really that bad? If it is then our grain exports should show it. 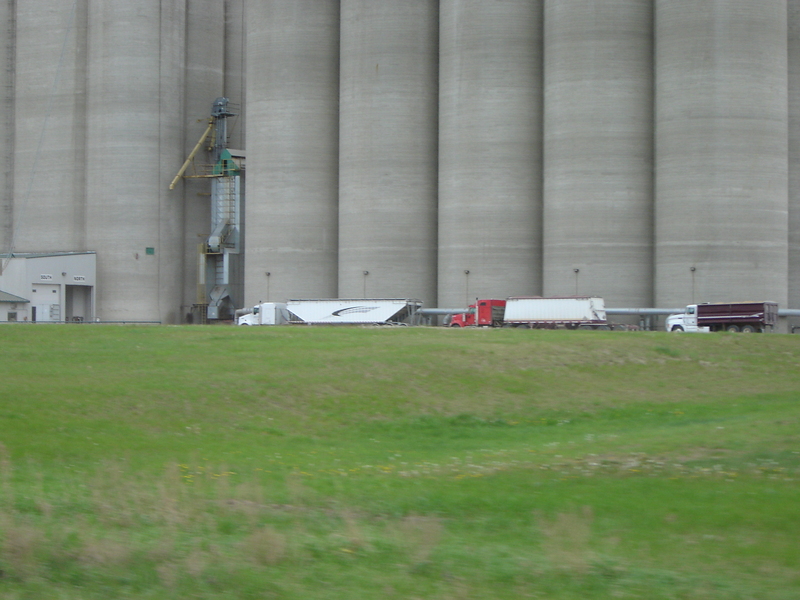 There are objective numbers about grain shipments and exports from Canada. According to the Canadian Grain Commission, as of crop week 39, which ended April 29, 2018, overall grain exports are only down a tiny 2.1% compared to the same week last year. Remember that last crop year, the Canadian Transportation Agency found the railways delivered 7% more grain than the previous year – almost a new record. In 11 of the 39 crop weeks overall exports are seldom down more than 1% and most of the missing export volume is accounted for by increased domestic use and the fall of canola and pulse exports. However, the real eye-openers are the numbers for wheat. Up to April 29/18 total wheat exports are up a blistering 14.75% compared to last year. The CGC also reports that in every week of the 2017-18 crop year Canada exported substantially more wheat than in the same period for the previous crop year. Claims by elevator agents they have no room ring hollow when their grain companies are moving more wheat than ever to export position. Even barley exports are up 66.8%. Smaller crops like soy beans are down 10%, while lentils, peas, and other pulses are down more than 50%, mostly because of Indian tariffs. Canola is down 5.4% and durum is down 10% after the private trade bungled quality assurance. It is these last two crops which account for the biggest part of that overall 2.1% drop in export grain shipments. It is the grain companies who are responsible for customers turning away from prairie canola, durum wheat, and pulse crops. It is notable the private trade has bungled quality assurance on the grains with poor export numbers. Without a single-desk marketer to manage logistics and deal with quality assurance there is no way prairie farmers will receive full value for their grain and customers will get what they want – when they want it. So there is little evidence for blaming the trains, at least this time. 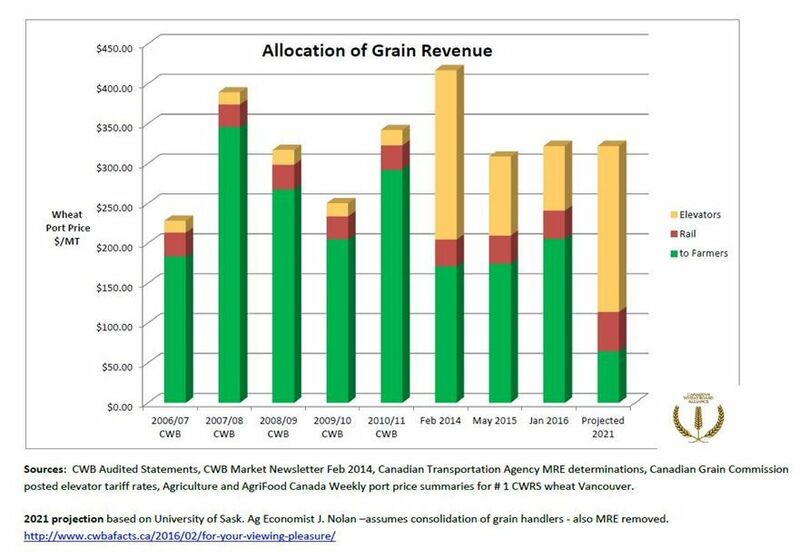 In spite of what you may read in some of the business press, the year-to-date export numbers from the Canadian Grain Commission show the railways are doing their job. So farmers and their former customers are the ones being short changed in many ways by the grain companies. Oil by rail is another excuse used by grain company apologists to divert attention from their poor management. The National Energy Board publishes monthly figures for oil shipments crossing the Canadian border by rail. The highest shipment month since 2012 was December of 2014 at 27,913 cubic meters (m³) of oil per day. As of February 2018 oil by rail is down to 21,306 m³ per day. It sounds like a lot of oil, but it is only 163 oil tank cars a day. This is a drop in the bucket compared to the roughly 1,300 grain cars a day that moved last year’s grain crops to port. Most oil still goes south into the United States to be refined. Grain goes west to the Pacific. 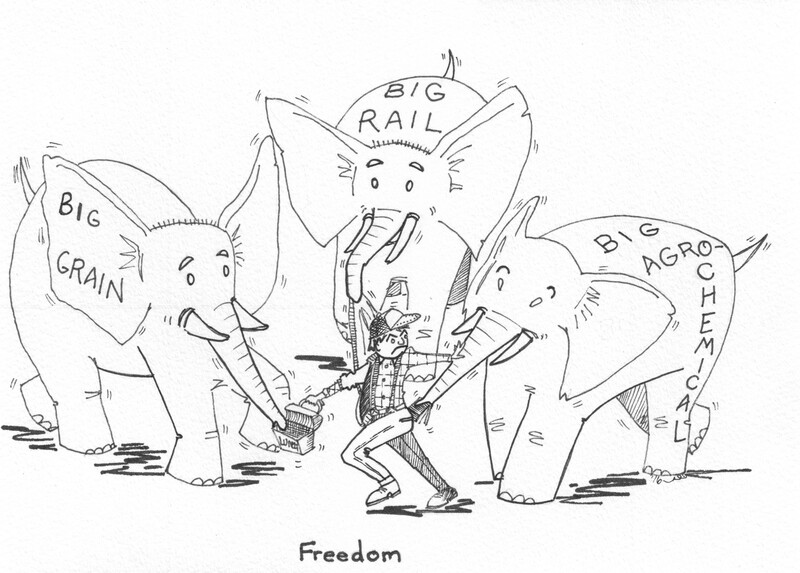 Adding oil transport to rail does not use the same tracks or mountain passes as grain – at least not for now. Scaling up rail operations to meet extra demand for shipping oil south is a matter of adding extra locomotives and crews. (April 19, 2018) It was Friday the 13th and on CBC Calgary’s Eye-Opener its business commentator reported that Saudi Aramco, the world’s largest oil company had a net income of US $33.8 billion in the first six months of the year on a cash flow of US $52 billion. It sounded like he was about to go into rapture right on the air. 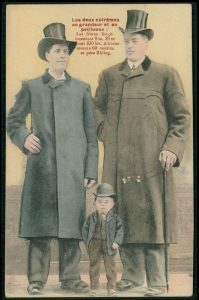 But hey, the show was coming from Calgary, Alberta where they have long ago forgotten their heritage as the birth place of the Alberta Wheat Pool much less the critical role played by Albertans in the formation of the Canadian Wheat Board. This demonstrates how most people are unaware of the invisible giants of agriculture that take so much money from prairie grain farmers and the Canadian economy. 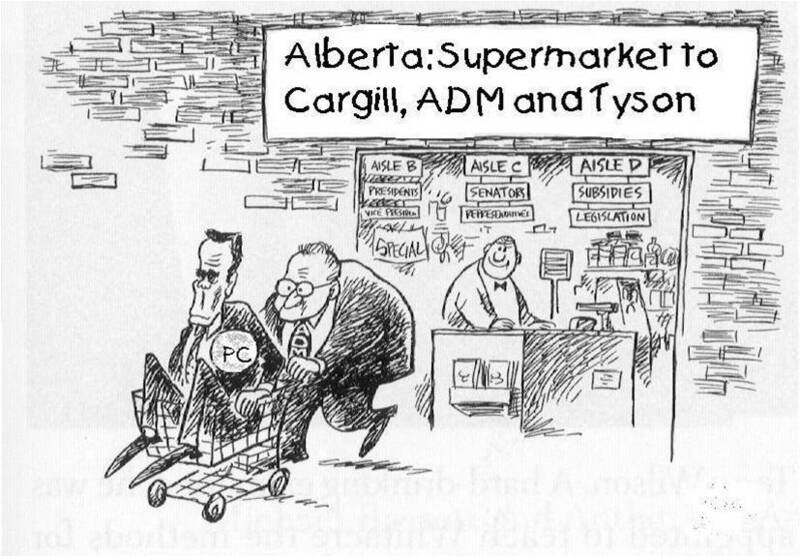 Just three years ago the public face of Cargill made US $120.4 billion and ADM made US $67 billion. Combined this is three times what Saudi Aramco took. Adding in the world’s third largest grain trader, COFCO (China National Cereals, Oils and Foodstuffs Corporation) at US $65 billion gives these grain traders combined revenue of over US $250 billion making Aramco look positively tiny by comparison. These top three grain traders now control over 70% of the world’s grain. The formerly mighty Louis Dreyfus and Bunge are in fourth and fifth place. 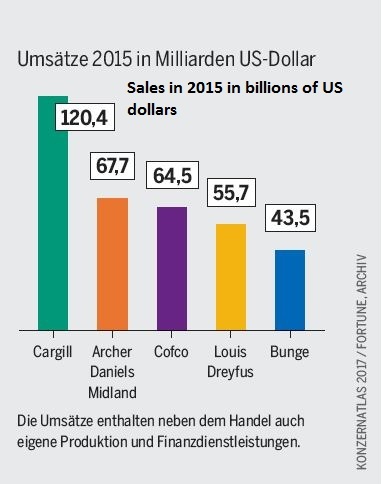 With the exception of a handful of other tiny grain companies these big five trade essentially all the grain in the world. The stakes in agriculture are very high and as the CBC commentator demonstrated, most people are oblivious. For those who regard giant companies dominating a market sector with some suspicion, it just keeps getting worse for both prairie farmers and people who like to eat. 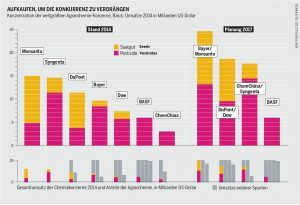 With announcement of the US Department of Justice’s approval of the US $66 billion merger of Monsanto and Bayer, the giants on the input side of agriculture are getting a lot larger too. 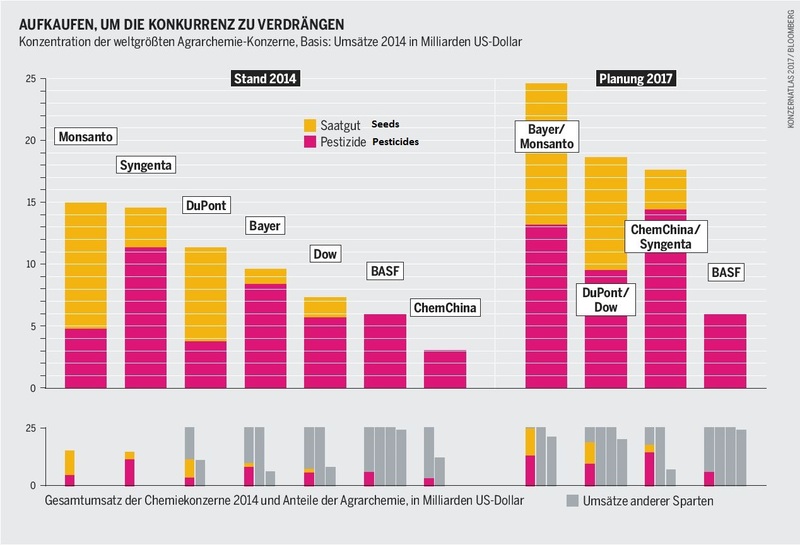 This merger on the agrochemical-seed side was preceded last year by the mergers of Dow with DuPont and Syngenta with ChemChina. Outside of Canada, these three companies now control almost 100% of the world’s agricultural seed development and over 70% of the world’s agrochemical market. Years ago prairie farmers met those giants by building cooperative grain handling systems, marketing collectively through the Canadian Wheat Board, and financing public interest plant breeding. Essentially western Canada was operated as a gigantic virtual grain farm when it came to quality assurance and grain sales. Working together provided huge price premiums to prairie farmers. With the killing of the Wheat Board those premiums are now being vacuumed up by the giant grain companies. For the first time in living memory number one Canadian hard red spring wheat is now usually trading at a discount to inferior US dark northern spring wheat. While the giant agrochemical and seed companies are consolidating to take more from prairie grain farmers on the input side of things, in Ottawa the Liberals and their feckless Agriculture Minister are carrying on with the Harper government’s plan to privatize the Canadian developed genomes for wheat, barley, oats, and other essential grains while the Alberta NDP’s agriculture Minister keeps his head down. In an Orwellian bit of misdirection this process of taking control of cereals genetics away from prairie farmers and giving it to the giant agrochemical seed companies of this world is being titled Value Creation Working Group Grains Roundtable. What it really means is taking the value of the seed genome developed by farmers and the Canadian public and giving its control and profits over to giant foreign agrochemical seed companies. 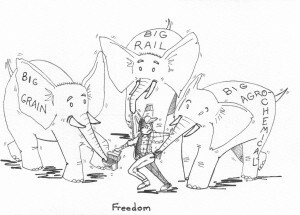 So while Alberta, BC, and Ottawa are in a lather about what amounts to chump change being lost because of what they claim is inadequate oil pipeline capacity to the coast, the really big money continues to be stolen from prairie grain farmers by the invisible giants of agriculture and siphoned to their shareholders. 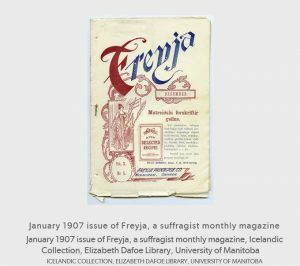 (March 8, 2018) On this international women’s day I learned of the longest running suffrage magazine in Canada. 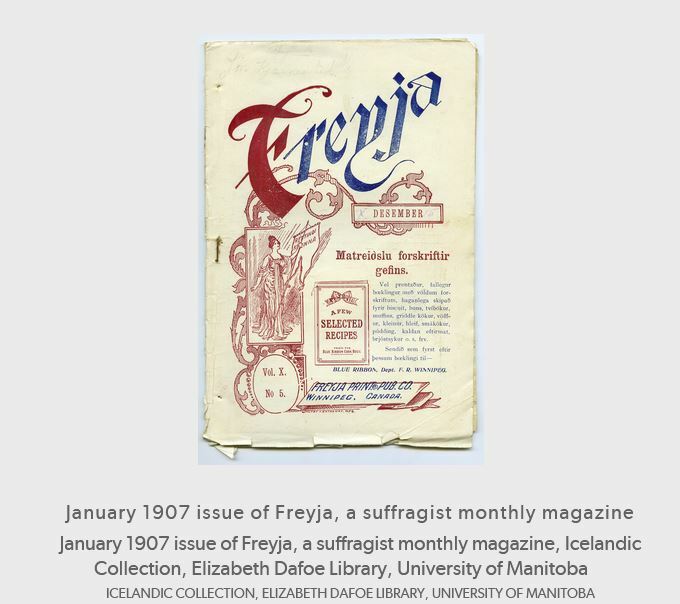 Freyja was published in Manitoba in Icelandic beginning in 1898 and ending in 1910. 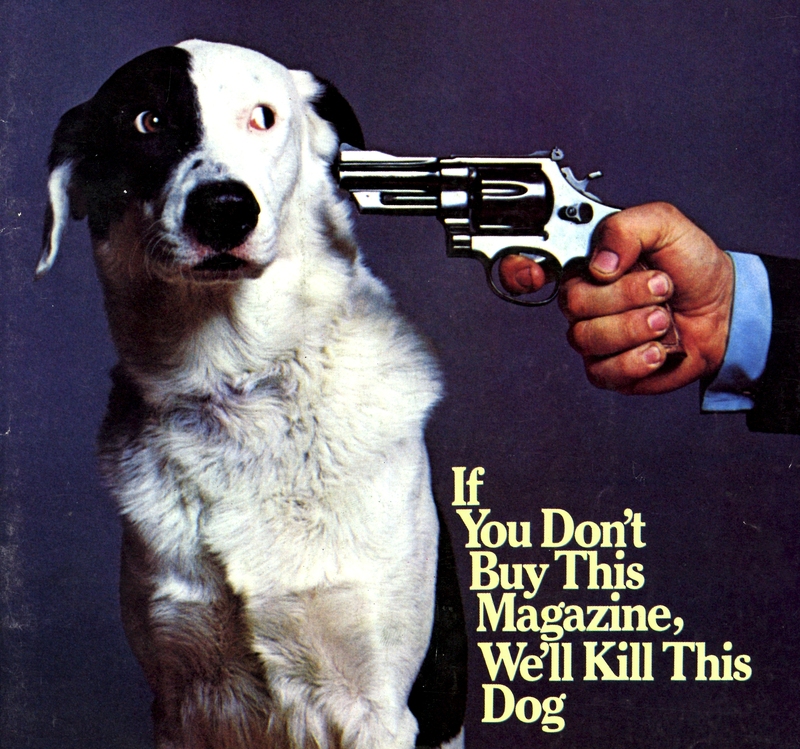 At the time it was considered the only such magazine being published in Canada. Its editor was Margret Benedictsson. This reminded your writer of a presentation called “Women of the Aspenland” from the mid 1990s in Alberta. Women of the Aspenland highlighted the leadership roles played by women working together on the various farm and community groups to enhance the collective market power of everyone from grain farmers to hog growers and their contributions to Canadian society. 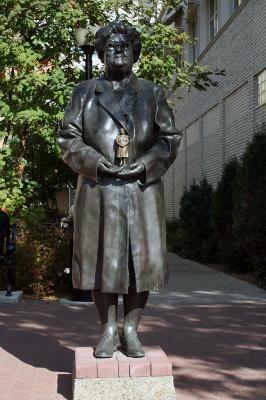 Hazel Braithwaite, one of our neighbours, was recognized for her long involvement with the United Farm Women of Alberta: “Her concerns, she said, were anything that affected the farm family.” She was later commemorated with a life-sized bronze statue by the City of Red Deer. As readers page through the various central Alberta communities they may be surprised to see the range and multicultural variety of women and their involvement in building Central Alberta. It would be possible to build a similar list for most of prairie Canada and those lists would be heavily weighted towards farm women. A surprising thought given the difficulties of transportation in the early days. In contrast with the older settlements of eastern Canada, prairie farm women occupied strong leadership roles with equal voice and votes in farm politics. 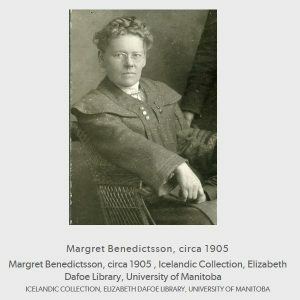 Rural prairie settler culture was not perfect, as the life of the pioneer Manitoba journalist Margret Benedictsson showed, but through hard work and an open prairie culture, farm women were considered “persons” in every sense of the word long before the famous five prairie women established this fact in law. (December 12, 2017) Over the past months the Canadian media has been filled with stories characterizing trade with China as either a golden opportunity or a blind walk into a totalitarian trap. There is the offensive smell of long standing racism mixed with the patronizing greed that has characterized most western relations with the Middle Kingdom for centuries. In this country we lack a deep sense of our own history. Add in a lamentable lack of Canadian academics who actually work on Canadian history and you have a formula for the forgetfulness now on display about trade with China. The neglect of that history has contributed to the mess facing Canada-China relations today. After the Korean war America led a boycott and food embargo against China which the grain farmers of western Canada defied. That food embargo caused wide-spread starvation in China. You would not know it from the current crop of politicians and commentators, but Canada, or at least western Canada, started developing a mutually respectful trading relationship with China when the CWB ignored the American-led embargo and sold almost four million bushels of wheat to China in 1958. Then the CWB signed a three year agreement with China in 1960. 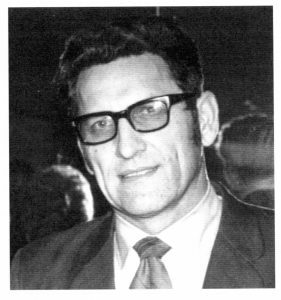 The American embargo and their pressure on Canada to stop selling grain to China were offensive to Paul Babey, the leader of the Farmers’ Union of Alberta and most of its province-wide membership. As a young boy I can remember the FUA local members meeting in our family dining room to discuss and ultimately pass a motion to support sending a new trade delegation to Mao’s China to negotiate grain, food, and machinery sales to that starving and recently war-torn land. The next year Babey and a delegation including the heads of the Prairie Wheat Pool Cooperatives and the Canadian Wheat Board went to China with the blessing of John Diefenbaker’s Conservative government. 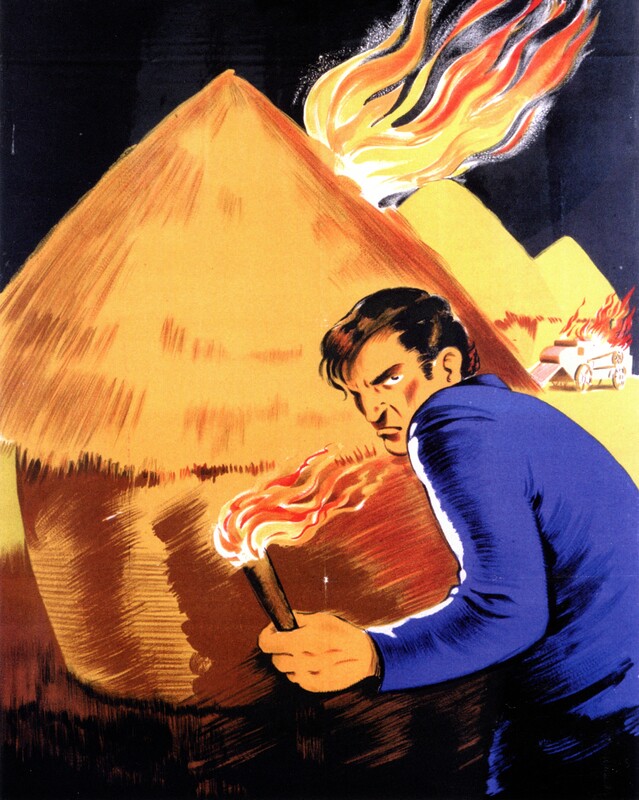 They promptly enraged the Americans by signing another sales agreement with China for prairie grain. 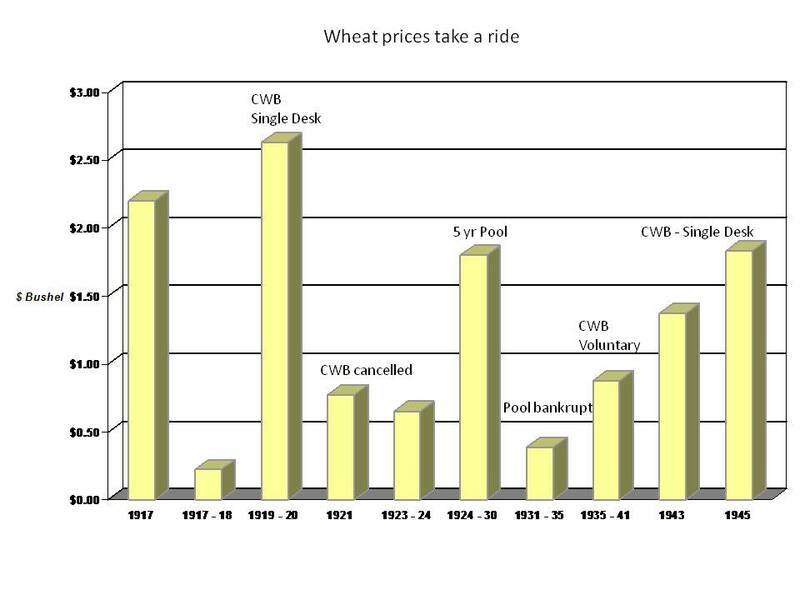 That was in 1964 and since then China was one of the Canadian Wheat Board’s most reliable customers – so much so that the CWB developed a full time office in Beijing. Adding insult to injury, last year when China asked for the same purity standards for Canadian canola as they were accustomed to being guaranteed on Canadian wheat our Prime Minister further insulted them when he took the side of the big foreign grain companies by insisting Chinese expectations were unscientific. Former Wheat Board staff familiar with trading in Asia – both China and Japan were long standing premium customers – told this writer and many others the key to trading in China was establishing a relationship of trust and respect. The Prime Minister’s insulting insistence on establishing a one-size fits all free trade agreement with China is simply another example of what I’m sure many in China and elsewhere will see as an arrogant and historically ignorant approach. Some years ago, the farmer-led CWB pointed out that bi-lateral agreements, modelled on its long experience in China, other Asian countries, the Middle East, and Russia were the much-preferred route for a country like Canada where relationships of mutual trust and understanding were established. Our good relationship with China is gone now. 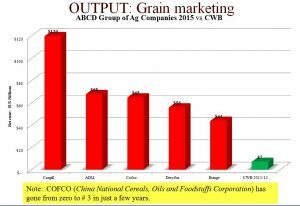 Once the Harper Conservatives killed the Canadian Wheat Board, the Chinese government agency China National Cereals, Oils and Foodstuffs Corporation (COFCO) transformed itself from a reliable customer for Canadian grain into a major international grain trader. Within less than three years COFCO shook up the structure of the international grain trade for the first time in over 100 years by becoming the third largest grain trader in the world. 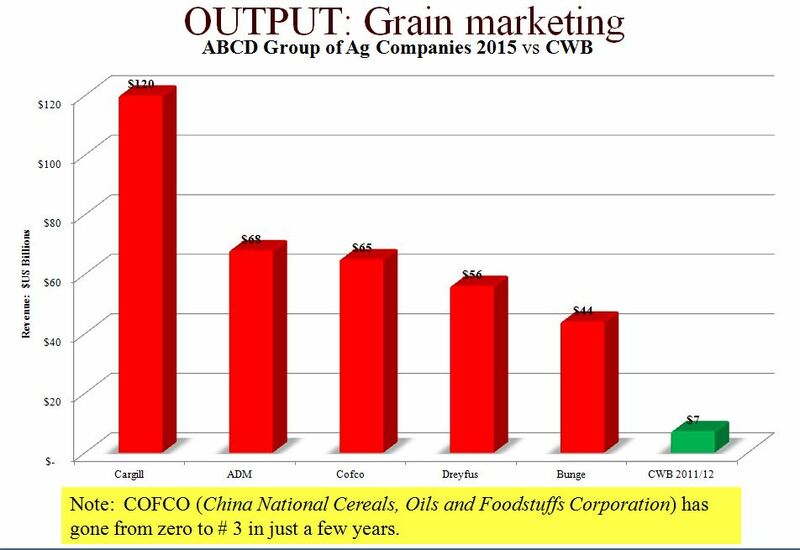 COFCO changed into a very strong player in the international grain trade for the simple reason that China will never again allow its food security to be threatened by the US-dominated private grain trade. Ottawa still has the chance to rebuild the relationship with China by re-establishing a farmer-controlled Canadian Wheat Board. 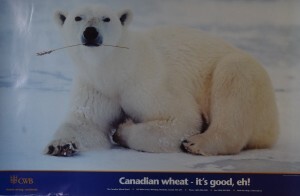 Aside from restoring the full value of Canadian grain to the prairie farmers who produce it, the restored CWB could salvage the relationship it built with China over the 48 years after the Farmers Union of Alberta and the CWB first demonstrated the honesty, quality assurance, and reliability Canadian grain became known for. 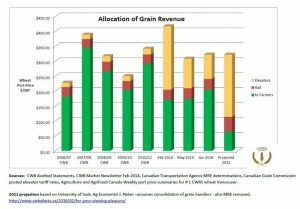 (August 1, 2017) The end of the Canadian Wheat Board five years ago certainly proves that unregulated capitalism works very effectively for the powerful and well organized. Declining numbers and increasing debt show it does not work for farmers. The CWB was a hybrid organization providing farmers with collective bargaining power, a professional standards association, and a world-wide reputation for honesty, quality-assured product, and reliable delivery. Oh, and it also dependably got farmers 88% or better of the world price for their grain after all the costs for transportation and marketing had been paid. Now farmers are lucky to get 60% of the world price and the private trade is scooping up record profits from money that once ended up in farmers’ bank accounts. Their local communities are seeing less spending thanks to farmers’ declining share of the world price too. Prairie farmers also had a very efficient storage and transportation system which was “right sized” to handle the whole prairie grain crop due to the CWB’s intelligent management. Now that intelligence is gone and the private trade is racing to make farmers pay for increased capacity in both inland storage facilities and port terminals. Never-the-less the vast majority of prairie delivery points are only serviced by a single company — two thirds in Manitoba and three quarters of the points in Alberta and Saskatchewan have only one elevator company. So most farmers are finding themselves at the mercy of only one grain company and their new master is the elevator agent who decides which farmers get to deliver grain, when, and what each farmer gets paid. The irony of having less choice as a result of a vociferous minority attacking the CWB demanding more choice is not lost on those who understand how the system works. One of the first things that happened with the end of the CWB was an avalanche of complaints from former customers about poor quality control and unreliable delivery. The end result was one of those customers, the Government of China, used its economic muscle to push aside the much reviled private grain trade and establish its own central grain trading agency (COFCO) as the third largest grain trader on the planet pushing the smaller Louis Dreyfus and Bunge down to fourth and fifth place. This changed the 140 year old order of the ABCD group of oligarchs on their perches but does nothing for prairie farm gate prices. Combine this upset with further consolidation of prairie grain handling and it makes the predictions from a U of Sk. Ag Economist that farmers will see their share of the grain price pushed down to just 20% seem closer to reality. Now that the CWB is no longer there to speak to the importance of quality control and meeting customer demands, as they did when Monsanto attempted to introduce GM wheat some years ago, we are also seeing moves to further privatize the cereals genome. We must remember this genome was paid for by prairie farmers and Canadian tax payers for the public good. Those are the big changes, but there have been relatively smaller ones as well, not least of which is the loss of Canada’s only northern sea port and its physical isolation with the loss of the Churchill rail line. Western historian Patricia Limerick suggests: “the frontier ends when the pimps come to town” something prairie grain growers are becoming all too familiar with as they negotiate a world without the CWB in which they no longer have any control and precious little dignity. (April 23, 2017) A few weeks ago I was invited to the annual general meeting of the Alberta NDP Party’s Rural Caucus to give a 20 minute presentation on issues facing agriculture which you can read here. The meeting was held in Camrose, Alberta, in the heart of some of the most productive farm land in Alberta. The audience for this meeting consisted of rural NDP activists and supporters as well as several NDP MLAs from rural ridings, members of the party brass, a couple of “stakeholder relations” people attached to the Premier’s office, and the Minister of Agriculture. I opened by pointing out that Canadian literature, at least according to some Upper Canadians, is all about the theme of individual “survival” but that the theme of western Canada’s history is one of cooperation and collective prosperity. That prosperity, I argued, is based on our sovereignty – our collective ownership and control of our grain production. As said before, you can download and read an annotated version of the presentation by clicking here. It covers the great grain robbery since the CWB was killed, concentration of ownership in global agriculture, and the background to the current moves to privatize the cereals genome being carried out by the residue of the Harper government in Ottawa with help from Alberta Astroturf. Lest readers assume that the Alberta NDP actually listened to any of this, not even two weeks later Minister Carlier introduced Bill 9 which gives the Alberta Astroturf check-off organizations the right to levy non-refundable production taxes on Alberta’s farmers – giving new meaning to “taxation without representation.” This was met with condemnation by many of the active farmers who are still Alberta NDP party members and by comments on Alberta Politics. This Alberta debacle is further evidence that losing food sovereignty is soon followed by a loss of political sovereignty. *As of this writing The Alberta Canola Commission, which actually uses a mail in ballot system is the exception among the Alberta check-off commissions. (March 28, 2017) Most of us have purchased a DVD movie and watched the threats of jail and fines for copying the content on the opening screen. Any farmer who has purchased private sector based canola seed (and paid seven times the cost of publically created Certified Seed) knows about these types of draconian copyright notices and contracts as well. What many farmers may not know is the same types of provisions (laughably called “protections”) are now being applied to the software which runs those nice display monitors in newer combines, tractors, and other farm equipment. Like a DVD, you may think you have bought and own the tractor but you may not own or control the software which allows it to operate. Last week one of Canada’s best east coast writers and reporters, Parker Donham, published a column on this subject which every farmer ought to read. Donham reports that if farmers do their own repair work, even simple mechanical repairs, this may violate the machine’s software licence and render it useless until the farmer pays the company to re-activate the software. If the article by Donham is correct, farmers can be forgiven for asking exactly what is the difference between ransom ware and the firmware landmines that are apparently part of the software of some farm equipment? 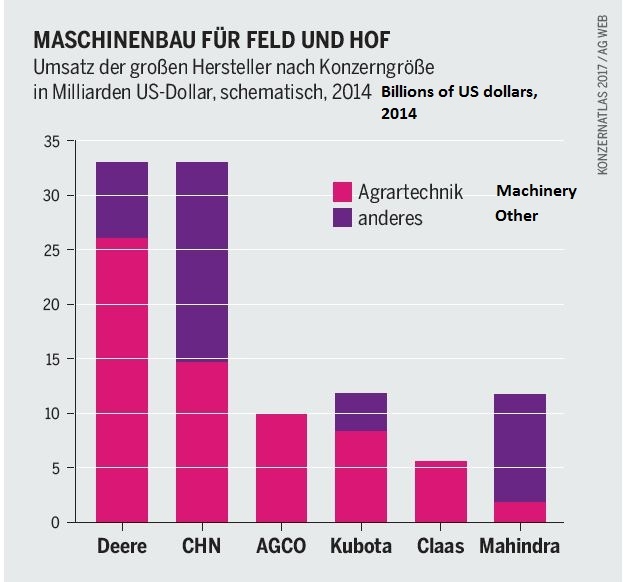 Readers may recall a report cited here a couple of weeks ago which shows that global farm equipment sales are dominated by two companies. Repairing farm equipment is already complex and expensive. Farmers really do not need the added complications of contending with software that makes the process more taxing than it already is. After all, it is not like they have much choice left in the matter. (March 8, 2017) In several previous posts about international women’s day the important role played by prairie grain farmers and their organizations in advancing the equality of women in Canada has been highlighted. From the 1890s the Territorial Grain Growers Association adopted a policy that women would be full and equal voting members and the web of support developed from there. How wide that web spread was brought home to me this weekend when I attended a lecture by one of Canada’s foremost art historians and a former curator at the Glenbow, Lisa Christenson, at one of my favorite venues, the Red Deer Museum and Art Gallery. The occasion was the presence of a very rare display of Group of Seven paintings. Most of us know the Group of Seven as upper-Canadian artists who, after their experiences of the First World War, explored and painted the forests and lakes of Ontario. Many of us know them from their paintings of the dreary and rock-bound Canadian Shield. But, some of them painted grain country. 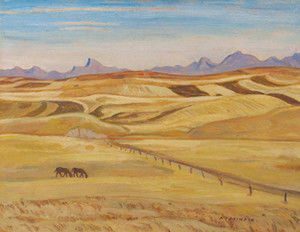 What I did not know was the many rural Alberta connections to the Group of Seven in general and particularly the role of one of the Famous Five, Henrietta Muir Edwards in supporting Fort Macleod, Alberta artist Annora Brown. 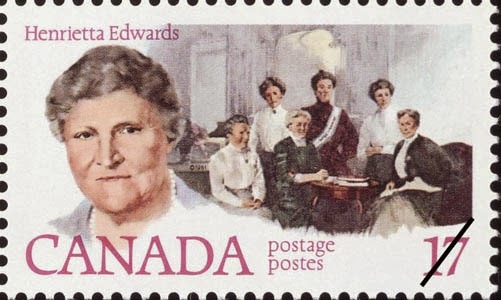 Part of the genesis of this artist lies with her exposure to the egalitarian feminist ideals of the western Canadian suffragettes she met at the meetings of the Women’s Christian Temperance Union and the Fortnightly Club. The Club was a southern Alberta book club of rural women formed in 1908 which arranged to have books borrowed from the distant Library of Montreal’s McGill University for the study of politics and art from around the world. 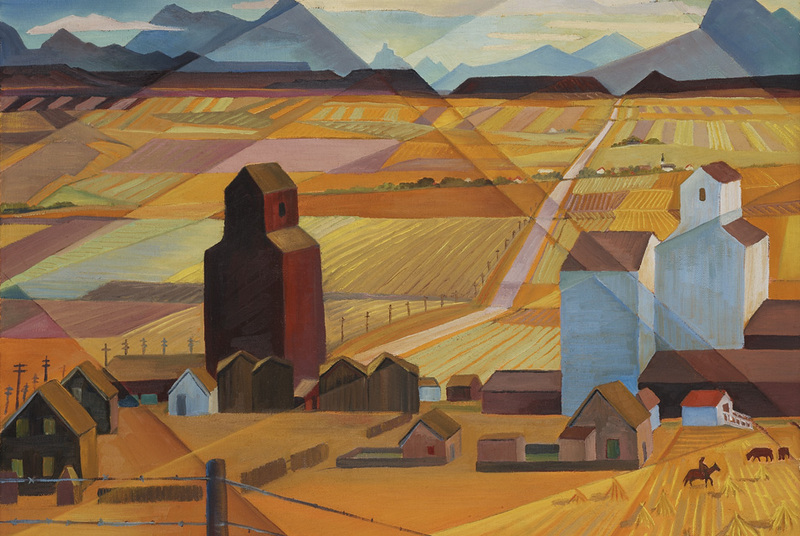 Brown went on to study with the Group of Seven in Ontario and developed her own prairie way of looking at the natural world. She went on to write and illustrate one of the influential art works of prairie Canada, Old Man’s Garden which did much to foster in prairie culture a love of the natural landscape rooted in Aboriginal tradition and a fine attention to detail. 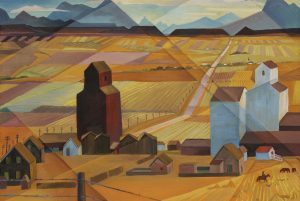 The exhibit, curated by Mary Beth Laviolette certainly contains its share of mountain scenes but much of it is devoted to paintings of the prairies, their inhabitants, and a few notable ones of grain elevators. Nobody who farms or has an eye for landscape can fail to appreciate these paintings. While he painted A.Y. Jackson was often a guest of prairie farm families who were part of that cooperative network. You can see one of Jackson’s original paintings where he even got the proportions of the elevators right, which is a rare and difficult thing to do. The exhibition runs until March 12, 2017 at the Red Deer Museum and Art Gallery. Grain farmers will feel welcomed by the elevator and grain motifs built into the entry to the Museum and the prairie paintings from the 1920s to the 1960s will be at once familiar and interesting. Just go in the front door and turn left into the gallery – admission by donation – and celebrate international women’s day and its deep cultural connection to prairie grain farmers. Are farmers dealing with 117 year old problem? (February 28, 2017) One of the most well founded complaints from prairie grain farmers is about not getting fair weighing and grading of their grain by elevator companies. In fact 117 years ago this March the Senkler Royal Commission tabled its report documenting how prairie grain handling companies were exploiting farmers through price fixing, dishonest weights, and even more dishonest grades. This Commission was part of how prairie farmers got the first pieces of legislation that would eventually lead to the Canadian Grain Commission with its mandate to enforce fairness in grading and weighing of grain. But guess what? I and many others have been hearing complaints lately that demonstrate the grain elevator companies are behaving in ways that have a strong similarity to the findings of the Senkler Commission. With the end of the Canadian Wheat Board and the gutting of the Canadian Grain Commission by the Harper government we probably shouldn’t be surprised. The Commission found that farmers were baited into the elevator with promises of a high price for their first quality wheat and then switched to a lower payment either because it was claimed the grain was a poor quality, or the elevator had no room for number one wheat but did have room for a lower value grade. 117 years later we are hearing similar experiences from grain farmers across the prairies. Some things just never change. The National Farmers Union is asking farmers for their experiences selling grain to elevators, mills, and other buyers. Instead of a Royal Commission holding meetings across Manitoba and the “North West Territories” as Alberta and Saskatchewan were then known, the NFU questionnaire will be mailed to NFU members and is available on-line so any farmer across Canada can put their information forward. The survey can be completed anonymously. The NFU on-line survey also contains some useful gems of wisdom too many farmers may have forgotten. For example the law requires that any grain delivery contract between a farmer and a grain company must include provisions for a penalty to be paid to the farmer if the licensed grain company has not accepted the farmer’s grain (of the kind and grade of grain specified) during the delivery period defined in the contract. It also contains a link to the Canadian Grain Commission web page explaining how to obtain a mandatory and binding grade on grain delivered to a licensed elevator. These provisions provide protection to farmers who use them. The NFU will keep all individual responses confidential and aggregate the results for future publication. This is an opportunity for farmers to have their say and give the NFU and government current information on the behavior of the grain trade. (February 16, 2017) The approval by the European Union of the Canada-European Union Comprehensive Economic and Trade Agreement (CETA) makes the world safer for the global agricultural cartels and much less pleasant for Canadian farmers and the consumers in both jurisdictions. Industry friendly farm groups, like the Alberta Wheat Commission, are accentuating the positive while closing their eyes to the reality of the giant global cartels setting themselves up to profit even more from farmers and food consumers. The EU’s Parliament also ignored a very useful examination of the global agricultural cartel called The Agrafood Atlas 2017 from Germany’s Heinrich Boell Foundation and co-published with Oxfam Deutschland and the prestigious French newspaper Le Monde Diplomatique, among others. It contains some astounding information about global agricultural business. Unfortunately, the report itself is only available in German, but with thanks to their good graphs, Google translate, and a little patience, I can provide a summation of some of its findings. 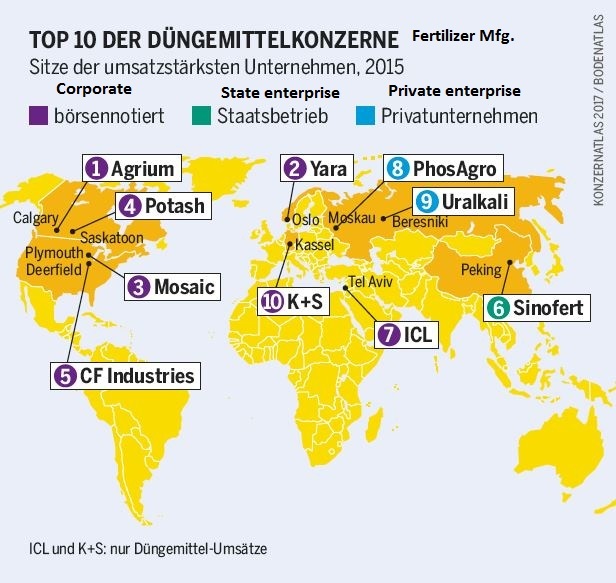 Their report says that in agro-chemicals and seed 7 corporations currently hold dominant positions. Soon there will be only 4. Just 3 of them, the report says, will control over 60% of the global seed and chemical markets. Also on the input side for farmers are the fertilizer manufacturers. The top ten identified last year include two Canadian firms, Agrium and Potash Corporation, who are in merger talks. Like grain, fertilizer is one of those bulk commodities that is very sensitive to transportation costs. 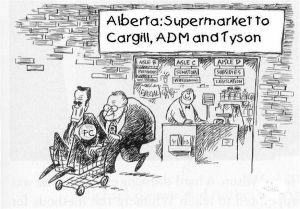 So the merger of Agrium and Potash Corp will create an effective monopoly fertilizer seller leaving prairie farmers as a captive market. 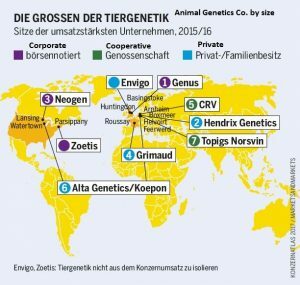 It will be no surprise to prairie farmers that “In wheat, maize, and soy beans there are only 4 international companies that dominate 70% of the market” – they’ve known about the ABCD group for decades, but what may be a surprise is that COFCO, the Chinese government and private food agency now ranks as number three. Effectively there are only 6 farm equipment manufactures with CHN and John Deere holding about 70% of the global market with Mahindra and Kubota tied for a distant third, and Agco and Claas bringing up the rear. 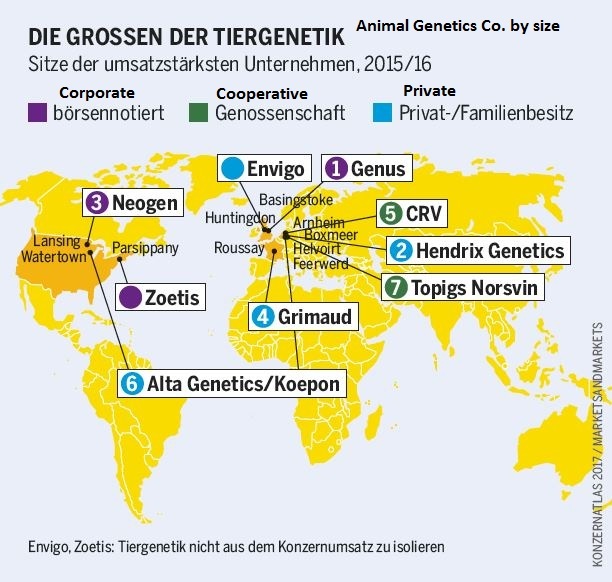 This grim trend continues with animal genetics which have effectively been cornered by just 7 global corporate giants. As these giant global corporations consolidate their power around the world, it is easy to see the coming attack on supply management of dairy, eggs, and chickens in Canada taking shape and following the model used to destroy the farmer-controlled Canadian Wheat Board. Ratification of CETA by the rubber stamp Parliament in Ottawa will seriously injure the dairy sector, one of the few Canadian farm sectors that is successful without government subsidies and huge farm debt loads. CETA will also place further pressure on Ottawa to continue privatizing the cereal grains’ genomes which farmers and the public have paid for over the years. We know from the miserable Canadian experience with the privatized canola model that private seed research costs more and delivers sub-standard yield increases. This also makes the Harper government’s destruction of Federal agricultural research libraries take on new significance. Farmers find themselves surrounded by giant cartels on all sides and it certainly doesn’t help farmers’ bottom line to be stuck in the middle without the collective bargaining power they once had in grain handling and marketing. Prairie farmers are already feeling the pinch of exploitation by the private grain trade having seen a third or more of the value of their production taken from them by the agents of the grain companies of the ABCD group. Canadians are learning about an economic rule of thumb known as the “iron law” of prices and wages: once a handful of corporations control the majority of the money in any sector, free markets are deader than door nails and without counter balances like marketing boards and labour unions, prices and wages are driven to subsistence levels. The increasing debt burden in the farming sector since the Harper government killed the Canadian Wheat Board demonstrates just how quickly this can happen. Food consumers, facing extortionate grocery prices and falling real wages, will only be fooled for so long by bogus claims taxes are the cause of rising food prices as they see farmers getting less and less for the commodities they buy in the grocery store every day. Given the reality of the giant cartels dominating essentially all the high ground of the global economy labelling treaties giving those corporations more power as “progressive” will not fool many people for long. Ratification of CETA will simply further empower giant corporations to take more money from farmers and consumers.